Annapurna Khayar Lake Trekking, located within high hills and ridge of massive Annapurna Himalaya with mere distance from Mt. 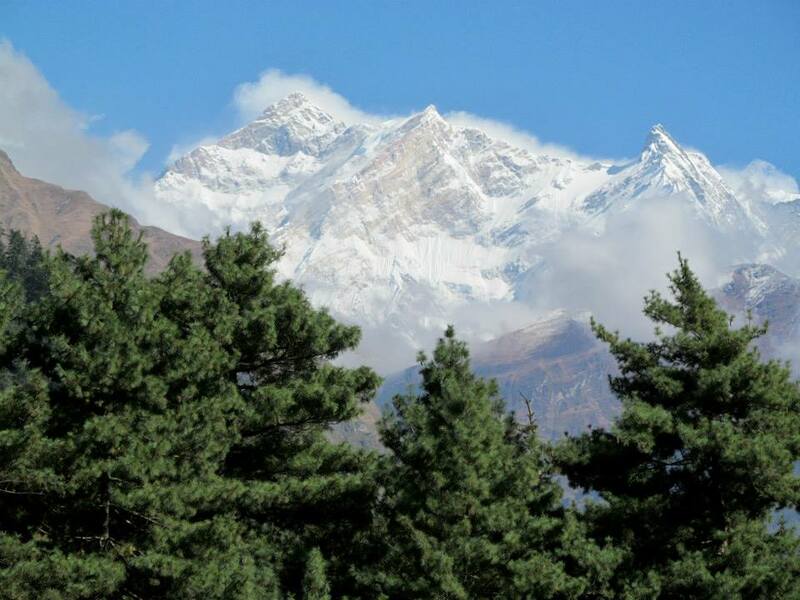 Dhaulagiri range, a great spot for enjoyable and thrilling adventure within ten days of wonderful walks on the hidden corners of mighty Annapurna range of mountains. Travelers must be unaware that even in popular Annapurna areas where trekking and other adventures is very much trekked and visited by thousands of wide world visitors, within this famous and leading destination around Annapurna are places yet to be explored. Where Explorer Adventure and its team of expert guide will show you the wonders of hidden areas of Annapurna Khayar Lake where very few trekkers seldom visits this scenic and beautiful serene destination within massive Annapurna Himalaya. Starting with exciting overland journey from Kathmandu to reach at scenic Pokhara city and its verdant valley covered within rolling hills and close views of Annapurna massive peaks that reflects on its calm serene Phewa and Begnas lakes. From Pokhara heading on the old Trans Himalayan Salt Trade Route Trail of Nepal and Tibet which lies beyond Ghorepani towards Upper Mustang, as walks progress encountering many farm villages as our path leads uphill within beautiful serene forested areas of tall rhododendron-magnolia-oaks-pines and fir tree lines, in spring and summer makes this countryside ablaze with wild flowers in full bloom. 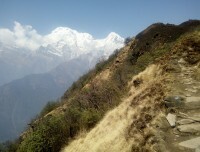 Slowly walk leads to Ghorepani village and interesting place with views of Dhaulagiri range where morning hike takes you on top Pun Hill above 3,210 m high offering grand sunrise views over array of peaks from Dhaulagiri-Annapurna to Manaslu range with majestic Machapuchare the Fish Tail peak. After Ghorepani and Pun Hill leaving the mainstream trekking trails heading north into pure wilderness away from main flow of trekkers and human village or settlement into remote isolated areas with climb to scenic Kopra ridge with stunning panorama of Dhaulagiri, Tukuche, Nilgiris towards west and Annapurna Fang / Vara Shikar in the north includes close views of Annapurna South. Enjoying views along the walks on high ridges of Khayar and Kopra hills then heading towards our final destination at Khayar Lake regarded as holy, a glacial pond hidden between massive peaks of Annapurna where once a year in the month of August great religious fair takes place with hundreds of local pilgrims visits for a dip in the holy Khayar Lake. With enjoyable and fascinating time then heading back to Pokhara taking another scenic route through Ghandruk and Landruk, a large Gurung people village where our wonderful walk end at Dhampus for short ride to picturesque Pokhara with mesmerizing and most fantastic adventure on Annapurna Khayar Lake Trekking. 1 Day 1: Arrival in Kathmandu and transfer to hotelsOn reaching Kathmandu Tribhuwan International Airport where you will be warmly received by our guide and staff and then transfer you to your respective hotels in the hub of Kathmandu city. First check into your hotel rooms on getting refreshed from the flight and with Jet-Lag, then join with other members of Annapurna Khayar Lake trekking for group briefing, where our expert guides will inform regarding your stay in Nepal, hotels, trekking, local lodge and overland drives with do’s and don’ts information, evening welcome group dinner in authentic Nepalese restaurants with Folk cultural programs to entertain you during your meals. 4 Day 4: Drive past Bhirethati and start trek to Ulleri village 1,720 via Tirkhedhunga 1,545 m - 03 hrs drive and 04 hrs walks.After a nice and pleasant stop in Pokhara with excellent views of Annapurna Himalaya with majestic Machapuchare Himal, having breakfast an exciting drive leads you for few hours beyond Pokhara valley to reach our starting point of Annapurna Pun Hill Panorama trekking. Drive leads past Pokhara valley outskirt with marvelous scenery of Annapurna peaks and farm lands and then reaching much warmer areas of Nayapul town by the road side of Pokhara and Beni highway. From here following Modi River to a nice and lovely village at Bhirethati and beyond to begin our first day walks through farm villages with uphill on stone paved steps to reach at Tirkhedhunga With short rest at Tirkhedhunga, walks continue with a climb on nice stone paved steps leading up to Ulleri village for overnight stop within Gurung and Magar tribe village with views of Annapurna peaks. 6 Day 6: Morning Hike to Pun Hill 3,210 m and trek to Sauta village2, 200 m - 05 hrs.Early morning hike up to Pun Hill for stunning sunrise panorama over array of Himalayan peaks of more than 360° wide angle views from Dhaulagiri-Nilgiris-Vara Shikar (Annapurna Fang), Annapurna range of peaks with majestic Machapuchare extends towards Lamjung Himal and Manaslu towards eastern horizon, after a wonderful moment head back to Ghorepani for breakfast and continue walk within rhododendron forest where walk leads downhill to Chitre village. From here our route diverts from the main trail heading due north towards Kopra ridge and Khayar Lake, as walk leads with short downhill then climb to a wide farm fields to reach at Sauta village for overnight stop with fabulous views of Dhaulagiri and Annapurna South peaks. 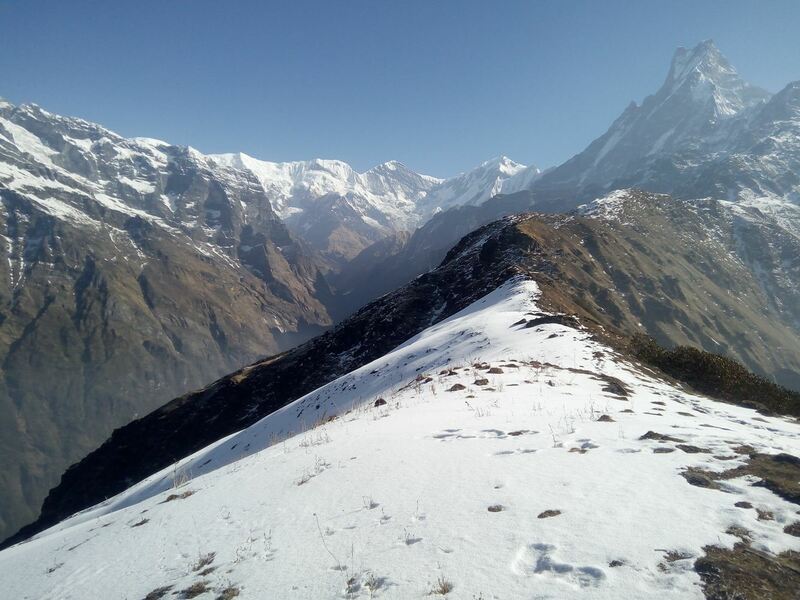 7 Day 7: Trek to Kopra Danda / Ridge 4,020m - 06 hrs .From here gaining altitude leaving tree lines behind after few hours of scenic walk reaching at overnight stop at Khayar or Kopra ridge, a scenic spot with scenery of landscapes along with stunning views of Mt. Dhaulagiri massive range and Vara Shikar (Annapurna Fang), Annapurna South which towers directly from this wonderful spot. 8 Day 8: Trek to Khayar Lake 4,620m - 05 hrs.Morning hike to holy lake at Khayer Lake located at 4,620 m. which is long walk, but worth the views, the site of religious festival occasion held annually around the month of August and September. Villagers from the surrounding area assemble here to offer prayers to Lord Shiva and bathe in the icy waters, offers sacrifices of sheep and goats. 9 Day 9: At Khayar Lake for local hike and exploration.A wonderful spot for rest day a relaxing time where you can enjoy beautiful surrounding within close distance to high peaks of Mt. Annapurna I, Annapurna South and Annapurna Fang / Vara Shikar, truly a blissful and pristine area, where very few trekkers often visits this amazing place. Here with ample time to explore the unexplored region of Khayar Lake with exceptional view points and in perfect harmony of nature. 10 Day 10: Trek to Chistibung 3,100 m -05 hrs.After a great time at Khayer Lake, walk back to Chistibung past Kopra ridge, starting with a slow gradual morning walk on off beaten trail passing farm fields and scattered Sheppard’s huts, trekking downhill through enchanting rhododendron and bamboo forest, walking small stream to summer pastures at Chistibung for overnight stop, a small place with few small huts serving as tea-houses. 11 Day 11: Trek to Dobato 3,420 m - 05 hrs.After a great time around Khayar Lake and Kopra hills, morning walk leads to a long descend through grazing lands in the middle of rhododendron forest to our overnight stop at Dobato, a summer pasture with views of Annapurna South and Mt. 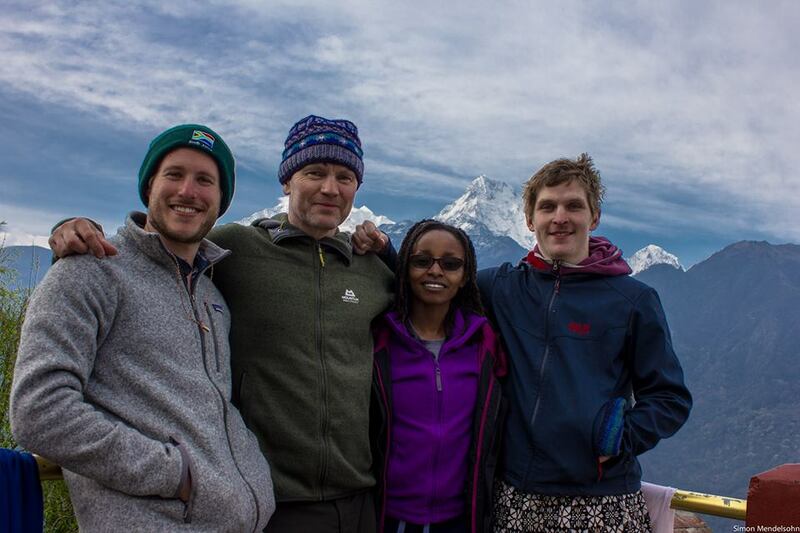 Machapuchare / Fish Tail peak at 6,993 meters. 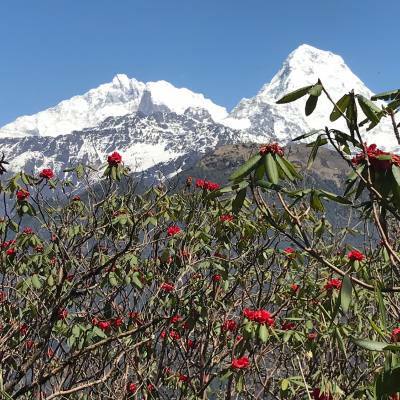 12 Day 12: Trek to Ghandruk 1,950 m - 05 hrs.With great views of mountains, morning walk continues downhill into forest of rhododendron, oak and magnolia, then reaching the main trekking route at Ghandruk and Ghorepani trail at Tadapani, after a short stop, downhill to Ghandruk for overnight in the comfort of nice and cozy lodge, with time to visit this large Gurung village of Annapurna region. 13 Day 13: Trek to Tolka 1,640 m via Ghandruk and Landruk villages 1,460 m - 06 hrs.With morning grand views walk is pleasant into cool shade of woodland with downhill to reach at Ghandruk village, one of the largest village around Annapurna areas populated by Gurung tribe of Buddhism religion and culture. From Ghandruk descend to Siwai farm village situated by the Modi River and then an hour climb to another large Gurung village of Landruk, where walks gets gentle on winding trail with short uphill to reach at Tolka for overnight stop with views of Annapurna South and Huinchuli peaks. 14 Day 14: Trek to Dhampus 1,530 m (04 hrs) then drive back to Pokhara 860 m - 01 hr.Morning walk leads through farm fields and small villages of Bheda Kharka on moderate winding path and then a climb for a while to reach on top Pritam Deurali overlooking views of Annapurna and Dhaulagiri with dramatic scenery of landscapes and then downhill to Potana with constant views of peaks and then finally ending our last day trek at Dhampus. Dhampus village located on a high ridge offering incredible panorama of snow capped mountain range, from here our walks completes with a short drive back to picturesque Pokhara by the Phewa lake side. 15 Day 15: Drive or fly to Kathmandu and then transfer to your hotels.Morning transfer into a vehicles either by car-coach or in tourist bus (as per the size of the group), for overland journey back to Kathmandu with scenic views of mountains, green scenery of hills and farm fields within nice villages and towns as drive brings you back at hustle and bustle city life of Kathmandu. On reaching Kathmandu transfer to your respective hotels with time for individual activities and shopping souvenirs. 16 Day 16: Depart for international flight home ward bound or to respective countries.Your last memorable day in Nepal after a wonderful experience on Annapurna Khayar Lake trekking with great service of Explorer Adventure, and as per your international flight then transfer to Kathmandu international airport for homeward bound or to your respective destinations. 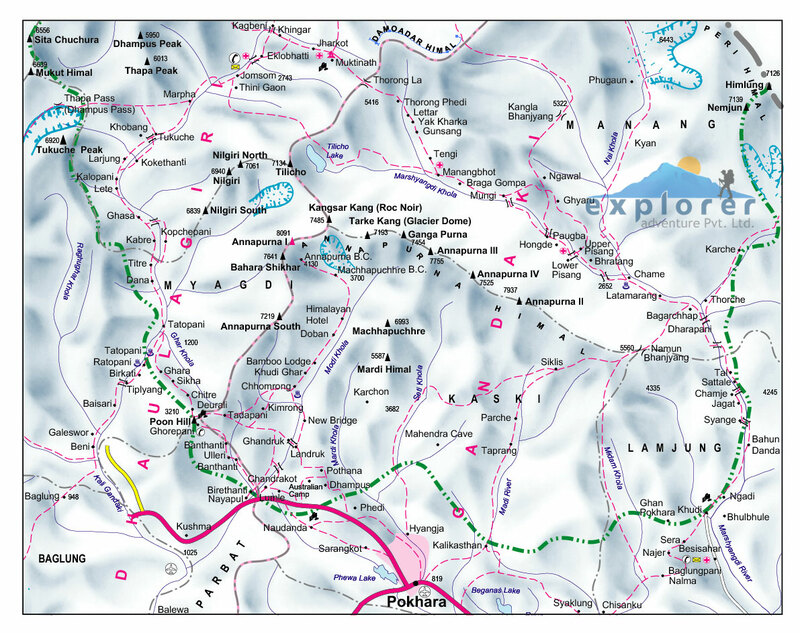 Highest elevation gain: At Khayar Lake 4,620m - 05 hrs and Kopra Ridge 4,020 m high.